Between the gorgeous Astons of the 1960s such as DB5s, often remembered for being driven by hairy chested men boasting triple digit names, and their striking newer cars like the DB9 or V8 Vantage, it’s easy to overlook some of their underdogs from between those periods. Enter the Aston Martin Virage built through the 1990s. At first glance, you can quickly see why this car was overlooked. With its square stance and remarkably under-stylized body, this car is not easily recognizable as an Aston. And when you look closer, you can play the parts bin game! For those of you not familiar with it, here’s a sample. Where do those tail lights come from? Nope! They hail from a Volkswagen Scirocco. The headlights? Well done, it’s an Audi 200. However, we must address the elephant in the room. By that, I mean the big, blue oval elephant. That’s right, this was the first car designed after Ford’s acquisition of Aston Martin. Which means many of the switches and control panels derive from Ford, and yes, that is the same steering wheel you can find in a Ford Crown Victoria. Finally, combined with its looks, its V8, RWD layout seems almost better suited for an American muscle car than an Aston. But don’t be fooled. While the DB7 sold in the early 90s was a shared platform with the Jaguar XK8, this Virage was an exclusive, expensive and hand built machine that was at the top of the range. Its 5.3 liter V8, with Callaway designed heads produced 335hp and was a fast revving beast. Even though the car weighed almost 1800kgs, the spring to 60mph was dealt with in the low 6 second range. You could get a Chrysler three speed automatic transmission, which, in an unbiased statement, is the wrong choice, or one of the fifty 5 speed ZF manuals, which is the right choice. But, the even righter choice is in one of the several limited version of the car that Aston made. Yes, you could have a convertible version, or even a 6.3 liter version, but what could possibly be better than this Shooting Brake version: Only four were made, but humans were born with four limbs which is a sign that you should sell one of your limbs to obtain this car because it is that cool. 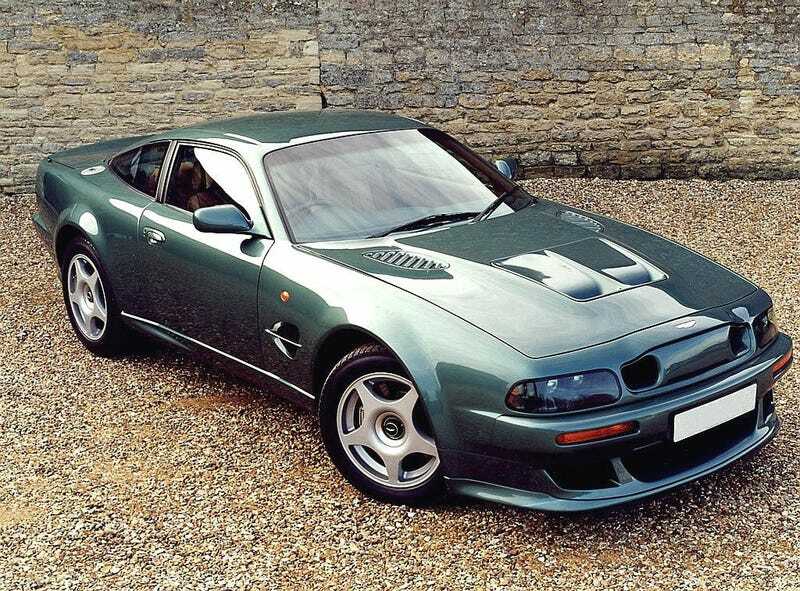 But perhaps the ultimate iteration of the Vantage is the high performance Virage model, sold from 1993 to 2000. With a refreshed and re-testosteroned design leaving only the roof and door untouched, this is one of the meanest Astons ever made. It still featured a 5.3 liter V8, but had two superchargers good for 550hp, making it one of the most powerful road cars ever made at the time. Top speed was 300km/h (186 mph), 0-60mph took 4.7 seconds, which is exactly how long it takes to say its full name, namely Aston Martin Virage Vantage V550. Oh, and the V550 is just to set it apart from the V600 versions which came out after 1998, which had a ridiculous 600hp. And of course, all that delicious power was available with 3 pedals. So, with stupendous power coming from an octet of cylinders and a trio of pedals, an aggressive yet underrated body and the greatest badge on the industry, this could be one of the greatest cars of the 1990s. Until of course, you hear of the one-off, V600 shooting brake version. With that in mind, I’m off to choose which one of my limbs to chop off. The Chrysler 300 is just like North Korea. Basically. 5 Alpina cars you will want.